Ars Biologica: Bacteria hailstone conspiracy! This news article on the BBC website mentions recent research findings that suggest bacteria can be the cause for precipitation! That extends the reach of bacteria into a realm that few would have guessed was possible. Go bio! Hmmm..... as a designer challenge, it would be interesting to design a genetically modified bacteria that causes for special hailstone shapes. 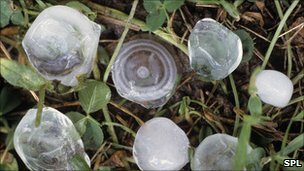 3) hailstones with a special crystal pattern that reflects various colors of light.